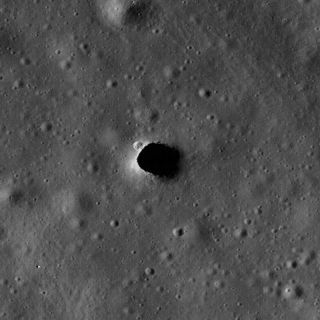 This pit in the Moon's Marius Hills is big enough to fit the White House completely inside and was photographed by NASA's Lunar Reconnaissance Orbiter. Photographsof enormous pits on the moon, some hundreds of feet deep, from unmanned probeshave given scientists a tantalizing glimpse into the lunar interior. Some of the moonholes are wide enough to fit the White House and scientists think they areopenings to underground tunnels that had been formed by rivers of lava. "Theycould be entrances to a geologic wonderland," said lead researcher MarkRobinson at Arizona State University. "We believe the giant holes areskylights that formed when the ceilings of underground lava tubes collapsed." Theexistence of tunnels in the moon was first proposed by scientists in the 1960s,when early photographs showed that hundreds of long, narrow channels trailedacross the lunar plains. Taken as evidenceof pastvolcanic activity, the grooves ? known as rilles ? had pointed to thepossibility of underground channels similar to lava tubes found on Earth. Lava tubesform when the upper portion of a river of molten lava cools and solidifieswhile the rest of the lava continues to stream beneath it. The insulated moltenrock can retain enough liquid warmth to flow for miles, carving out tubularchannels and complex labyrinths. Images fromJapan's Kaguya spacecraft depict gaping holes on the same plain, or lunarmaria, as the winding rilles. One particular pit appears in the middle of thechannel, leading scientists to believe it represents the collapsed roof of anunderground tube. Researchersspeculate that the tunnels, if unclogged, could serve as passages and livable lunarlairs for humans. "Thetunnels offer a perfect radiation shield and a very benign thermalenvironment," Robinson said in a statement. "Once you get down to 2meters under the surface of the moon, the temperature remains fairly constant,probably around -30 to -40 degrees C."
Explorerswould be sheltered from daily temperatures that swing from 212 degreesFahrenheit (100 degrees Celsius) during midday to minus 238 degrees Fahrenheit(minus 150 degrees Celsius) at night, as well as from possible asteroids. But furtherexploration would be needed before the tubes could be used. "Holdoff on booking your next vacation at the Lunar Carlsbad Hilton," said PaulSpudis of the NASA-funded Lunar and Planetary Institute in Texas. "Manytunnels may have filled up with their own solidified lava." Viewed thoughentrances, the blackness of the enormous pits for now remains a tantalizing wall. "Wejust can't tell, with our remote instruments, what the skylights lead to,"said Spudis. "To find out for sure, we'd need to go to the moon and dosome spelunking." Relaying howa lava flow mapping expedition in Hawaii revealed a surprising system of ventssimilar to the skylights photographed, Spudis left open the possibility of alunar labyrinth. "Itturned out that there was a whole new cave system that was not evident fromaerial photos ? Who knows? The moon continually surprises me," he said.